I love to share my passion of quilting and teaching with my students and customers! My classes are jam packed with my cutting, piecing, and pressing tips and techniques yet individual attention for their success is #1 in my classes. I encourage my students to have FUN, to “step out of their box” in trying something new, and work at their own pace as there isn’t a “quilt police” in my classes. I also encourage students to work towards excellence in quilting, but to have FUN in what they’re creating! If after viewing my lecture and classes pages, and your group, guild or show needs something different, please contact me to see if something can be custom-fit to your needs. Piggy-backing with different guilds or shows while I am on the road is a win-win for everyone! Since I live in Washington, and if I am already teaching or vending in your part of the country, contact me as multiple shows or guilds can share in my travel expenses. * Also book me now at this year’s prices for the future to also save on expenses for your show or guild! Please contact me for more information using the form below; and to book a lecture, and/or class. 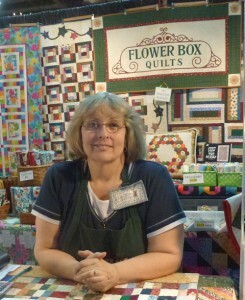 For more information about me and Flower Box Quilts see our about us page.